10 Berelands Avenue is a spacious semi-detached bungalow with attic conversion, situated in this sought after location, the property comes with lounge, kitchen, shower-room, sun room, three bedrooms, beautiful garden grounds to the rear and off street parking to the front. A timber garage provides external storage. In summary the lower level extends to entrance hall front facing lounge, the kitchen comes with integrated oven, hob, extractor, fridge / freezer and leads through to the sun room. The sun rooms overlooks and provides access out to the rear garden. Two double bedrooms and shower room complete the lower level. Stairs lead from the hall to a spacious bedroom with fitted wardrobe courtesy of the attic conversion and rear facing dormer. Externally the property has a spacious rear garden, laid out in patio paving with lawn and mature shrubs and trees adding to the privacy. To the front is off street parking for multiple cars, a shared drive leads to the rear of the property and access to the timber garage. 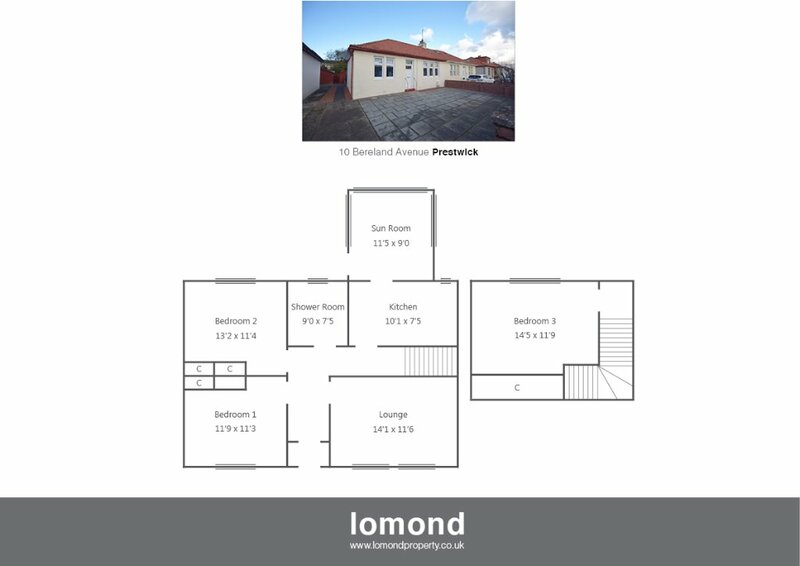 Bereland Avenue is a sought after location not far from Prestwick Town Centre and offers ease of access to the main road networks. Prestwick has a vibrant Main Street with a number of independent retailers, coffee shops, bars and restaurants, supermarkets are close by and the town offers both primary and secondary schooling. On entering Prestwick from the North, A79 / Monkton Road, continue onto Shawfarm Road followed by a right onto Shaw Road continue along before turning rights on Berelands Road followed by a left onto Bereland Avenue, the property can be found on your right.